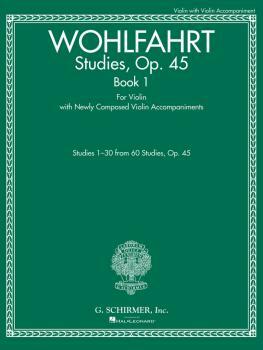 A fresh take on a time-honored classic, this edition of Wohlfahrt's Op. 45 Studies for Violin (Book I) features newly composed violin teacher accompaniments. Make technical study a fun and collaborative experience. The accompaniments provide an enjoyable introduction to ensemble playing. Playing in duet will sharpen the student's intonation and listening skills. The teacher will be able to coach the student on other aspects of ensemble playing as well, including the importance of subdivision and rhythmic accuracy, how to play a melodic versus an accompaniment line, and how to play through a mistake for the sake of the ensemble. The accompaniments also give the teacher the valuable opportunity to guide the student nonverbally on phrasing, dynamics, and tempo through his or her own playing.